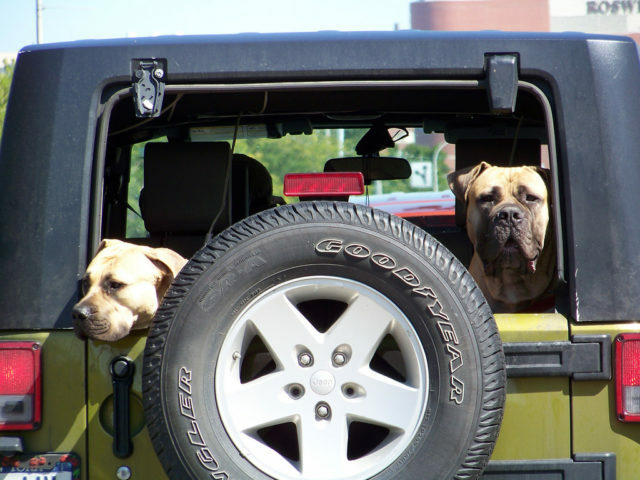 As I’ve said before, dogs love Jeeps… especially our dog Tenor, who is the world’s biggest Jeep dog! And there’s nothing better than a Jeep ride with your dog. We take our dog for rides in the Jeep just about every day — year round. These heavy-duty dog toys are all officially licensed by Jeep, so they have the official Jeep logo on them. They’re perfect for Jeep dogs on the go! Jeep Camouflage Toy Balls — Tough balls for dogs in assorted camo colors with the official Jeep logo. Jeep Vinyl 8-inch Key Dog Toy — Your dog holds the key to your heart, and now he can hold the key to the Jeep, too! The official Jeep key dog toy is no longer available, however this vanilla vinyl key dog toy is a good alternative. Hubcap Jeep Dog Toy — The official Jeep hubcap dog toy is no longer available. A good substitution is the Hyper Pet hubcap-shaped chew toy for dogs. Made of EVA foam, it floats and it’s durable.